Book Early to stay anywhere near Buena Vista during the summer months. Some dates are unavailable as early as April. Mt Princeton Hot Springs Resort is located on both sides of Chaffee County Rd 162 in Chalk Creek Canyon. The resort has rooms and cabins for all budgets and is a great place for a large group to stay. Cabins come in three sizes, plus there is the Main Lodge, Cliffside Lodge and the budget friendly Hillside Lodge. The Hillside Lodge, where we stayed, is a motel style building across the road from the main lodge and hot springs. It is located next to the upper pool and water slide. Our room was clean and looked like a typical motel room. Check in early so you have plenty of time for the natural hot springs and swimming pools. Cell service is very poor in the area. We found it necessary to go up the road behind the Hillside Lodge to get service. Verizon signal was slightly better than AT&T. In 1909 this historic hotel opened in the heart of downtown Salida. Over 100 years later it was renovated into 15 suites that include well stocked kitchenettes. The accommodations and service at the Palace Hotel are outstanding. Complimentary breakfast is delivered to your door each morning. Located in Colorado's largest historic district, shopping, dining, Riverside Park, and the Arkansas River are within footsteps of the front door. 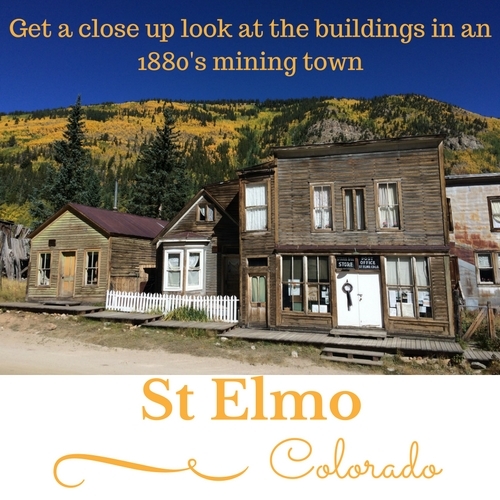 Ghost Town Guest House is a Bed & Breakfast located in the historic ghost town of St. Elmo. We haven't stayed here....Yet. Looks nice. This 1930's cabin is located next to the General Store in St. Elmo. It sleeps 3 and goes for $79/night if you bring your own bedding. Bedding is available for an additional fee if you don't bring your own. Cabin has a stand-up shower inside and an outhouse located out back. Kitchen has double burner and mini fridge. They also provide a coffee can of sunflower seeds for the chipmunks!! We spent 3 nights here and loved it. There are also several books to read as you relax on the porch in the evening. Rent the entire lodge or a single room. Located on the Arkansas River near Highway 24/285. Hot tub, river access, and pet friendly. Guests get a discount on rafting from The Adventure Company. Creek-side cabins, lodge rooms, dormitory rooms, & tent sites make this an affordable place to stay for all budgets. Below are a few additional options. There are a number of other smaller motels, B&B's and cabins in the area that we have not listed. Salida is located along Hwy 50 about 30 miles to the south of Buena Vista. The Amigo Motor Lodge - Located on Hwy 50. Completely remodeled in early 2016. Monarch Mountain Lodge - 22720 West US Hwy 50. Pet Friendly. Less than 5 miles from Monarch Ski Area. Woodland Motel - 903 W. 1st- Pet Friendly Motel - Full Kitchens in some rooms.